HammerHead® Trenchless, a Charles Machine Works Company, of Lake Mills, Wisconsin, USA, and Per Aarsleff Pipe Technology, of Aarhus, Denmark, have signed a long-term, strategic partnership agreement that includes plans for HammerHead to produce and distribute the Bluelight LED Curing System for Cured-In-Place pipe (CIPP) to markets outside of Europe and Russia. Per Aarsleff Pipe Technology is a top Infrastructure Contractor in Europe with extensive experience in trenchless applications. Its trenchless division, established in 1978, produces and employs its own CIPP liners, resin and installation equipment, including the Bluelight LED Curing System for 4” to 10” laterals. With more than 50,000 installations completed in Europe, the Bluelight system has a proven track record of quality and reliability. For more information, visit https://www.hammerheadtrenchless.com/bluelightled. Charles Machine Works is The Underground Authority – a Family of Companies delivering the most advanced equipment and solutions for underground construction and service in the world today. Our Family includes Ditch Witch®, Subsite® Electronics, DW/TXS®, HammerHead®, Radius® HDD, American Augers®, Trencor®, and MTI® Equipment. Together, the Charles Machine Works Family of Companies offers the most complete line of solutions for the full life-cycle of underground pipe and cable. For more information visit charlesmachine.works. Aarsleff Pipe Technologies is a European market leader with global experience within trenchless pipeline renewal. Since 1978, we have pioneered and produced No-Dig technologies in our advanced, in-house, R&D laboratory and production facilities. We offer our services as a supplier and as a contractor - and have carried out complex pipe-renewal projects throughout Europe and the rest of the world. 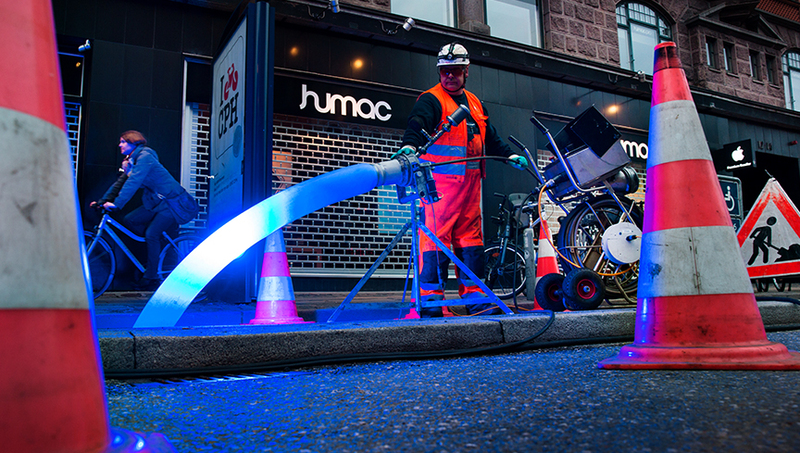 With our complete product range of certified No-Dig pipe solutions using LED, UV, water or steam, we are able to renew virtually any existing pipe system, profile, length and diameter with minimum disruption to city life. Aarsleff Pipe Technologies is a part of Per Aarsleff A/5, a leading Danish contracting company with 6,200 employees worldwide. Aarsleff is listed on Nasdaq Copenhagen A/5 and the Group's annual revenue amounts to EUR 1.5 billion.